Fuel lines and zip ties... What? Not OE? Topic: Fuel lines and zip ties... What? Not OE? My wife was supportive of getting an old motorcycle... 'til it spent an hour in the garage. It smells like the Valdez is docked in there. I think I'm getting close to the culprit - and guessing Honda did not use plastic zip ties to secure fuel lines? It might be time to re-plumb the fuel system. Re: Fuel lines and zip ties... What? Not OE? How clean is your gas tank inside. If its super clean and your petcock has a filter then eliminating those inline filters will tidy things up also and make for less joints. You want to keep in mind that the zip ties will get brittle over time with heat. Better solution is to get spring clamps like these. The regular hose clamps that screw down aren't that good. Black zip ties is much better than white that usually become very brittle very soon. Mini hose clamps... Agree about clean tank and no additional filters. My K6 have done over 110.000 km without additional fuel filter and NO fuel starvation except for one when I used a tank with rusted cap and clogged air vent. you didn't say what model you have but honda used these metal clips that are still available . These are for a 550 but should be the same for most hondas from the seventies. Thanks guys. It's a '73 CB500 Four. I'll check the tank. If it looks good in there, I'll ditch some/all of those filters, run some new fuel lines and use the proper clips. I found the bike would smell of gas when the petcock was not shutting the gas off properly. If the fuel valve shuts the gas off nothing else matters. Time to rebuild the petcock. I use zip ties on snow mobiles and atv's all the time. I think they work fine. as above the black ones are much better. also the smaller the zip tie the better for this job. If you use new fuel line (soft), the correct size, anything will do. A proper hose clip is what works and looks best. If it were me, I'd use 5.5mm fuel hose and spring clamp style hose clamps as mentioned above. You are still going to have some fuel smell in your garage since most vintage bikes have vented gas caps that can vent fuel vapor directly to the atmosphere. This was going to be my comment. Get the right size hoses and you don't need clamps. My 550 and 750 both had brand new 5.5MM hose and no clamps with no leaks of any kind. I wondered about that - if the petcock might be contributing. I’ll test it this weekend. 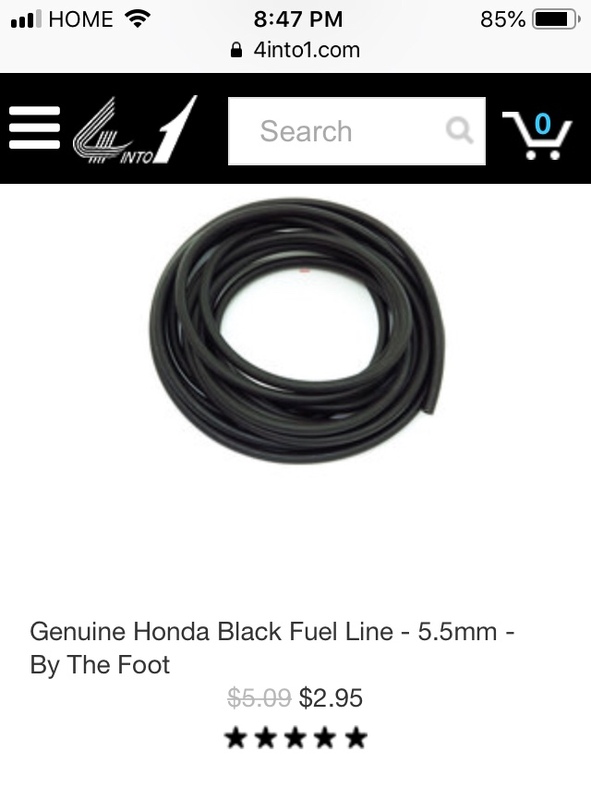 Can the 5.5mm fuel line be found at auto parts stores? Or, is that size specific to motorcycles? You need length 18 and 30 cm. Ditch the inline fuel filters. Below my collection. All gave troubles. Unlikely, auto parts stores have the 5.5mm hose. I don't think that size is common for autos. Better to try motorcycle shops. Do NOT let them sell you vacuum hose. That rubber doesn't last long with fuel contact. The 5.5mm size was common on many Japanese bikes in the 70's and 80's, so the line should be available at most Japanese bike dealers. I have never found an auto parts store that carries it. You can also buy it by the foot from many sellers on Ebay. Thanks guys. My first (of many) packages from 4into1 arrived yesterday. Replacing the fuel lines will literally be the first work on this... or any motorcycle for me - and I'm looking forward to it! I have bought many parts from 4into1 and am quite satisfied overall and they ship quite quickly. Quality isn't always the best though. I bought an ignition switch/seat lock combo last year for my 750F and the seat lock broke after only a few months of use. Take your time and enjoy, often a PO will have used 1/4" fuel hose because it's what the parts guys have in stock. It's too big and prone to falling off and leaking. Watch your carb overflows closely, gummed up carbs often have a problem there. Remember to turn off the petcock every time too.